for coders of all levels. Cross platform (windows, Linux, and mac). Find and Replace with REGEXP option. Free software (open source, public domain, etc). Remote Files: gvfs supplies FTP, SFTP and more. Find and Replace: allows POSIX and Perl regular expressions. 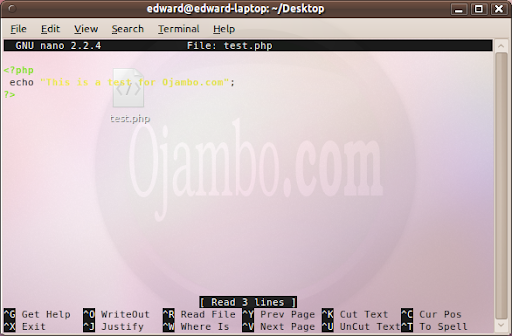 External Integration: customizable for commands, filters and parsers in Tools Menu. Snippets: customizable with Apache, C, HTML, PHP, SQL and more. Bluefish is easy to use for beginners. The 2.x series of Bluefish added code completion and tag closing for inline or nested languages such as CSS. 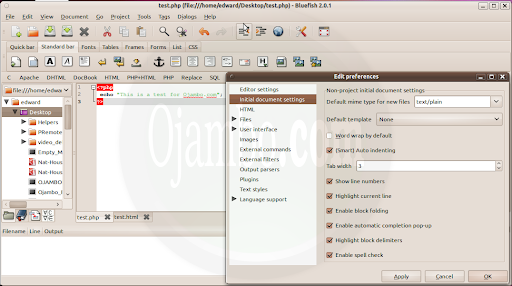 Bluefish was the first dedicated programming editor that I became really comfortable with. Snippets: customizable with C, HTML, PHP, PYTHON and more. To this day, the Geany 0.19.x series are still the fastest editors I use that are not command line based. Geany loads up faster than basic text editors. If you want to use it as an IDE for JAVA or PHP it won’t disappoint you. 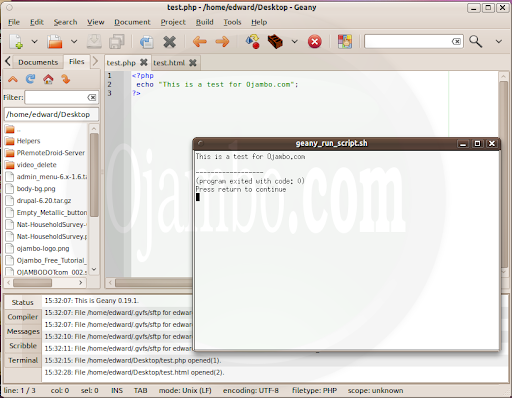 Geany comes pre-configured to compile builds and execute your code in the output pane or shell pop-up. Geany does not require running two separate windows to see the output of your code unless it is HTML for which you will need a browser. The one complaint I have with Geany is the way it keeps moving to the left side of code when the mouse is clicked anywhere above 80 characters on one line. This small annoyance prevents me from replacing all my text editors with Geany. Geany is also highly recommended but only if you have at least basic programming knowledge. Gedit is a simple editor that can been extended with plugins. One of my favourite features is the snippet for automatically wrapping selected text. Once the snippets plugin is activated, select text, then press SHIFT + ALT + W to edit the wrap tags which are paragraph (<p></p>) by default. Since most programmers probably start with a graphic text editor, gedit will be a favourite. Syntax highlighting comes configured which is great for a text editor focused on basic text editing. Gedit is slowed by the file browser plugin which makes Gedit feel no longer lightweight. For light work, Gedit is recommended, but do not get overwhelmed with the plugin choices. Multiple Documents: Previous META/ESC/ALT/WINDOWS KEY <. Remote Files: ssh or putty for FTP, SFTP, but it can be installed on an external server. Find and Replace: CTRL W allows POSIX and Perl regular expressions. Syntax Highlighting: multiple languages with include for the language in nanorc file. Web Development: HTML, CSS, works right on your server. When you start programming and are looking for recommended editors, your search might take you to websites where experienced programmers shun graphical programming editors. Some of the recommendations will be command line tools such as vi and emacs. As great as these command line editors are, they lack simplicity for beginners. Learning to do simple things using the command line way can be frustrating. If you program remotely, you will find some of these tools pre-installed. Nano is great in that it shows the basic commands at the bottom and one of those is “^G” which is CTRL G for help. I use nano all the time both locally and remotely. I can copy and paste using the mouse which is great for making changes on servers. There are only three commands needed to master Nano. Copy which is also Cut, Paste which is also Uncut, and Save which is also Exit that prompts you save changes. For beginners and advanced users, Nano is recommended as a lightweight programming alternative especially remotely. License: Historical Permission Notice and Disclaimer. 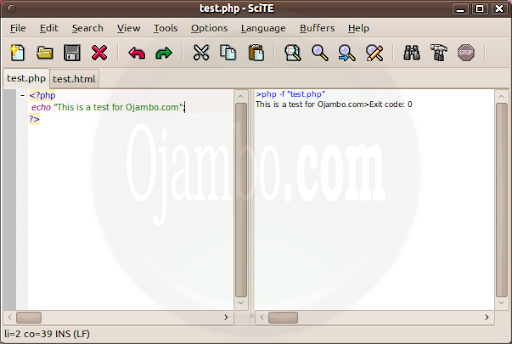 SciTE stands for SCIntilla based Text Editor. SciTE has a great feature that is partial implemented in Geany. While pressing the CTRL Key, it is possible to place the cursor on multiple lines at the same time. This feature allows a programmer to quickly put separate tags on each line of text. I discovered SciTE while looking for such a feature while I was not yet comfortable with regular expressions and other command line tools like awk or sed. SciTE does not have code completion but it is fast and has everything needed for a lightweight programming editor. I do not recommend SciTE for beginners because it does not have code completion. Some of the editors will need to be complied for your operating system. Using the command “time” and the name of the program, the real load time was crudely measured by opening and closing the program. Nano was the fastest lightweight programming editor at 0.098 seconds because it was command line. SciTE was the fastest lightweight programming editor with a graphical user interface (GUI) at 0.578 seconds. Geany was my pick and came in third fastest lightweight programming editor at 0.989 seconds. Bluefish which is my recommendation for beginners for a lightweight programming editor had a time of 1.188 seconds because of plugins and language files. Gedit had a time of 1.590 seconds which good for fifth place in the review of lightweight programming editors. In conclusion, the lightweight programming editors where chosen so that they could be easy for beginners to grasp. Once beginners start progressing, more options will become available. Advanced users can try GNU Emacs and Vim. Try different editors until you are comfortable and settle on a favourite. Please make a suggestion if some lightweight editors were overlooked. This entry was posted on Monday, May 30th, 2011 at 2:17 am	and is filed under Reviews. You can follow any responses to this entry through the RSS 2.0 feed. You can leave a response, or trackback from your own site.